City of Imperial Beach Announced on the internet today that they have put in wheelchair access to the ocean and that they have wheelchair especially available for the beach available to the public. 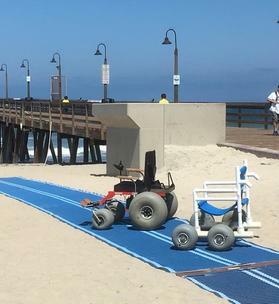 Wednesday City of Imperial Beach Management Analyst announced on the internet, "We don’t our beautiful and sandy beach, but in the past, traversing the sand in something like a wheelchair was difficult at best. Now, we think we have provided a partial solution that may help some participate fully in beach events. We hope so! ." Ed Vea went on to say, " Both manual and powered beach wheelchairs are available when lifeguards are on duty at the Dempsey Center (www.ImperialBeachCA.gov/MarineSafety for more information). 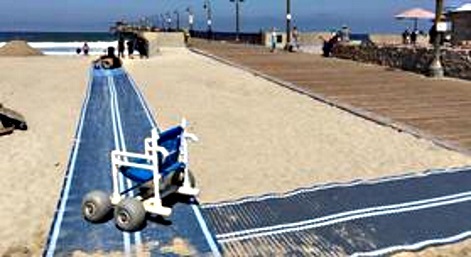 The disabled access mats have been installed at the Pier Plaza and we advise anyone wanting to reserve a beach wheelchair to call our power beach chair reservation number 619-685-7972. Additionally, Dunes Park access mats are scheduled to be installed this Thursday." He did not say for how long the mats would be in place. The city has already had the wheelchair program in place for many years.